I met some friends for the Beijing Duck (Peking Duck to those of us who remember the days when most foreign city names were anglicized) earlier this week that is the off-the-menu specialty of Sun Wah BBQ restaurant on Argyle Street. The duck was beautifully prepared and delicious. First, the meat was carved off the breast and eaten with bao buns, and then the remaining meat was pulled off the carcass and stir-fried with rice or noodles (we chose noodles). The third dish, a winter melon soup made from the carcass, had a tasty broth but the soup itself was a little bit meh. But, it was not meh enough to detract from the other two dishes and was well worth it. I would do it again. There were only three of us with that whole duck, though, so there was a bit of meat left over. We divvied it up and I went home with a leg, part of a wing, and a couple of breast slices. It was more than enough for one serving but I didn't really have anything to go with it. I was describing the dinner to my friend at work and mentioned that they offered either noodles or fried rice with the meat they pull off the carcass and she said she would have opted for the fried rice instead of the noodles. And just like that I knew what I was going to do with that duck. 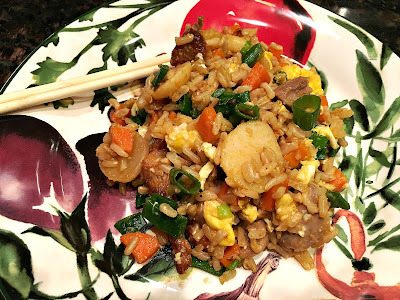 I cooked the rice that night when I got home so it would have time for the grains to separate and dry out, and then the next night I put everything together and had myself a lovely meal of duck fried rice. My friends and I decided we would happily do the Beijing Duck dinner again. It would definitely be worth it if just to have the leftover duck so I could make some more fried rice. I realize that duck is not something one has hanging around their kitchen every day. This recipe would work just as well with chicken or pork. You an also mix and match the vegetables as you desire; just add them from those take the longest time to cook first, up to those that only need a minute or two. Prepare all of the ingredients before heating up your wok or skillet and have them ready to be added t the pan. Mix the soy sauce, sherry, vinegar and tomato paste together in a small bowl and set aside. Heat wok or large skillet until it is just starting to smoke. Add 1 tablespoon of the peanut oil and swirl to coat. Add the egg and cook, stirring constantly with chopsticks to break them up. Remove the eggs from the wok and set aside. Add the remaining oil and add the garlic and ginger and let it cook for about 30 seconds. Add the carrots and cook for about 1 minute, then add about 1/4 cup of water and stir everything together. Cook, stirring constantly, until the water has evaporated and the carrots are just tender. Stirring constantly, add the onion whites and cook for another minute, then the water chestnuts and cook for another minute and then the peas. Cook for another minute or so until everything has been thoroughly heated. Add the duck or chicken and cook for another minute or two, until it is thoroughly heated. Add the rice and cook, still stirring constantly, until the pieces have separated and the rice has been heated through. Add the soy sauce, sherry, vinegar and tomato paste and stir it into the rice mixture until well blended. Remove from the heat and add the chopped greens from the onions. Taste and add more soy sauce of desired. Stream a scant of the toasted sesame oil over and serve while still hot.